To start downloading Mikogo Version 4, click on this Download button and follow instructions displayed below. 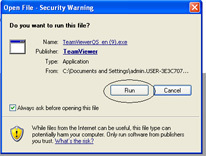 A window will appear asking “Do you want to run or save this file?” Click “Save” to download the file. When the download is complete, double-click on the downloaded file and then click on “Run“. If you’re using Windows Vista, at this point you may see a User Account Control window. Please click “Continue”. Installation will take just a couple of moments, and Mikogo will then automatically start with the Mikogo panel appearing on your desktop along with an icon in your system tray. To start a session, please click on the start symbol and then the Start Session button. Once in the site ring us on 00353 (0)52 6170851 with your Session ID number. Enter your name into Your Name area. Once above points are complete click on Join Session button (with left button). Click on Run button which will appear on bottom of your screen.